CAPE CANAVERAL, Florida -- Following the capture of the SpaceX Dragon capsule, the commercial Space X spacecraft is now being positioned at the end of the International Space Station's robotic arm for installation onto the Earth-facing port of the Harmony module. European Space Agency Astronaut Andre Kuipers and NASA Astronaut Don Pettit are at the robotic work station in the space station's cupola. NASA Astronaut Joe Acaba is standing by to bolt the Dragon onto Harmony through commands he will issue from a laptop in the Destiny laboratory. Although the crew is running slightly ahead of schedule in the installation procedures, NASA says a specific time for berthing cannot be predicted. A NASA and Space X mission status briefing is scheduled for 1 p.m. EDT to discuss the day's activities. NASA is reporting that the International Space Station Expedition 31 crew successfully captured the SpaceX Dragon capsule with the station's robotic arm at 9:56 AM EDT. The feat came 3 days, 6 hours, 11 minutes and 23 seconds after the mission's launch. The station was 251 miles over northwest Australia when capture occurred. In a brief e-mail to media, SpaceX spokesperson Kristin Brost Grantham said, "CAPTURE COMPLETE!" This will be the first time in space history that a private commercial company has docked with the International Space Station. During the 18 days that Space X Dragon will spend docked to the International Space Station, the crew will unload its cargo of about half a ton of food and clothing packed inside the pressurized section. On flight day 6, Dextre and Canadarm2 will move in closer to inspect Dragon’s external surfaces and its “trunk”—the open, unpressurized section of the spacecraft that will later be used to transport a variety of payloads and science instruments on future missions. 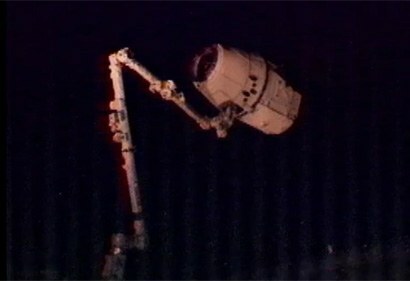 The SpaceX Dragon capsule was securely bolted to the Harmony module of the International Space Station at 12:02 p.m. EDT. A mission status briefing is scheduled for 1 p.m. to discuss the day's events, which will air on NASA TV (www.nasa.gov/ntv).